Any time I post a photo of my kitchen, people always notice and ask about one thing: what do I think about rugs in the kitchen? I have a runner in front of my sink, so when those photos come up, so does the question: "how do you keep it clean?" Conversely, when I post photos of my dining table, people often ask why I don't have a rug under the table. So what do I really think about rugs in the kitchen? Here's what I've come up with in pondering that question: I love rugs in the kitchen, but they have to fit in with my lifestyle. ::Groundbreaking deduction, I know:: Here's the deal, I love textiles and I think rugs are the perfect way to bring a pop of color or texture to a room. But they don't always make sense. Case in point: every time I sweep/mop under my kitchen table, I find at least one food item that has been spilled there and left to fossilize, crystallize or some other "-ize" that makes it totally gross. Rock-hard chicken nugget, anyone? Any time I think about putting a rug under my table, I remind myself that now may not be the best time because I have young kiddos who aren't always great at keeping things on their plates. It's SO much easier to clean up spills on hardwood! So I satisfied my desire for a kitchen rug by putting a runner in front of my sink. It's a high-traffic area, but we don't really eat near it, which makes it a little less prone to spills. Seems to be working out so far! So while I don't have the magic equation for figuring out whether a kitchen area rug is right for you, I can share a few things I considered when deciding to go with a kitchen rug. 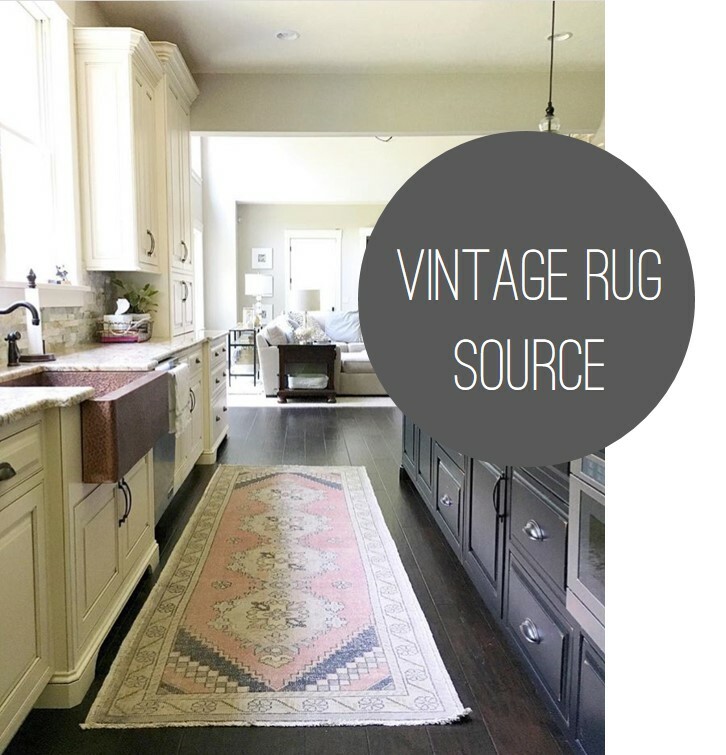 Check 'em out below and let me know what you think about rugs in the kitchen! Ballard Designs Seaton Indoor-Outdoor Area Rug. If you have an indoor/outdoor rug on your porch, you know that they can weather the elements nicely and are pretty easy to keep clean. I literally hose mine off every once in a while and they look brand new. This same performance can be really helpful in the kitchen. And because indoor/outdoor rugs have come a loooong way in the style department (bye-bye rough, scratchy, fake-grass carpet from my Grandma's front porch! ), it's pretty easy to find one that looks great and is easy to maintain. Kirkland's Ivory and Blue Floral Pattern Area Rug. I grew up in a family of hunters...so when I think camouflage, I think "hide things." That same logic applies to stains, yes? Patterns can be forgiving when it comes to the occasional tiny spill, crumbs, dog hair, whatever. In most cases, a pattern will go a long way in masking those types of things in between sweepings. I can attest to this first-hand with the runner in front of my sink. It’s vintage and 60+ years old. I’ve had it in front of my sink for 2.5 years and I know we’ve dripped things on it, crushed Froot Loops into it, etc., etc., etc. But it still looks amazing! I sweep it each day and blot up any occasional big spills. Other than that, it’s pretty low-maintenance! Rejuvenation Allison Indoor-Outdoor Flatweave Rug. I love sinking my feet into a shag-weave carpet or rug...just not anywhere near where people (my people...more specifically, my kids) are eating. I feel like a high-pile rug would just become a jungle of hidden food, legos and Lord knows what else...stealth spills because I wouldn't find them for weeks and, by then, they'd be even tougher to get out. So for me, I looked for a low-pile or flatweave rug. It makes it way easier to spot spills or crumbs and sweep them away. UrbanRug Vintage Oushak Runner in Modern Farmhouse Kitchen with Copper Sink_Farmhouse Redefined. If you’re going back and forth on getting a rug for your kitchen and the thought about it getting ruined keeps running through your mind, just wait! Whether you're waiting until you become more comfortable with the idea...or you're like me and you're just waiting for your kids to get a little older, sometimes it pays to hold off until you find the rug that will check all your boxes in terms of style and functionality. See it in action: This isn't really "action," but more like a bonus--I get a ton of questions on the runner in front of my sink, so here's the Etsy shop where I purchased it!